There's been some changes 'round here. First of all you'll notice the snazzy new AclinCorp banner up top, courtesy of my Photoshop hookup, Wizard Universe Message Board user krypkrwly (aka Larry Joe). Then you'll notice that you're currently viewing aclincorp.com - no blogspot in the URL! Yes, I sprang the $10 for the domain. I feel like a genuine businessman. Finally, and most disarmingly, you'll find all references to the book coming out in September wiped clean, replaced with November. There's a good reason for this: that's when the book's coming out now. My publisher at Arcana Comics assures me that this will help the book make a bigger splash, and I've never put out a comic book before so I tend to bow to experience. 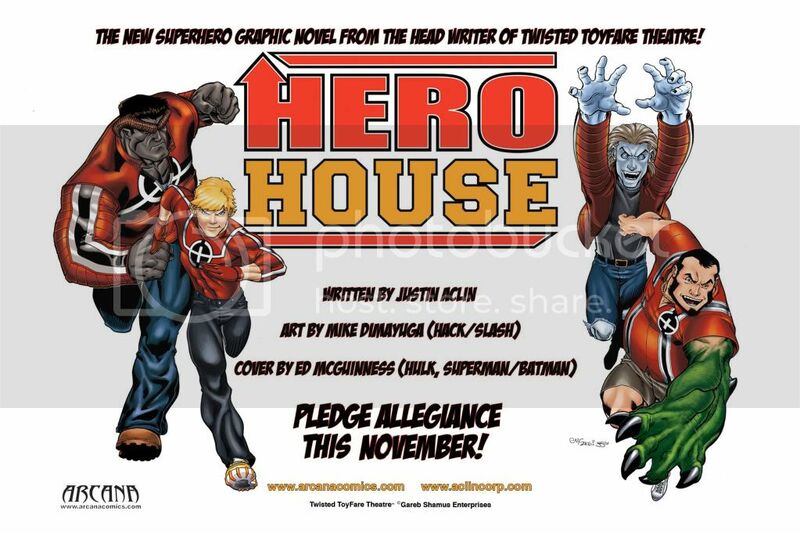 The plan, however, is still for Hero House to make its debut at next month's San Diego Comic-Con (which plans also currently call for me to attend. Stay tuned!). I'll be back soon with more behind-the-scenes kind of stuff, but watch this space - posting will reach a fever pitch leading up to Hero House's debut. That's the plan, at any rate. And finally, a question. My buddy Ryan Penagos is the prom queen of Twitter (over 500,000 followers) and he's been pressuring me to join up. Do you folks think Twitter's the logical next step for AclinCorp and its relentless Hero House promotion? Would you follow me? Input is appreciated! effing cool ad dude! the more i see that logo the more i like it. kudos to whoever designed it. Mike's issue of Hack/Slash hits today!